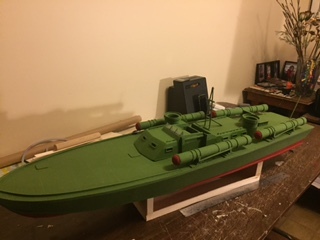 Just about ready to install running gear and Radio, Painted now, guns will be installed next week, next pictures hopefully it will be on it's sea trials...this is 1:24 semi scale scratch built from plans I purchased from Petter. This is a very nice built. Did you used the plans provided by Petter? What kind of power arrangement she has? Nice! Nicely done, John. 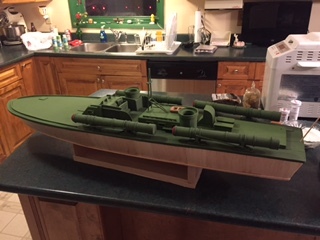 Especially considering it's your first scratch build. Obviously you have built stuff before though. One thought, be careful with dope over acrylic - the solvent in the dope may raise the acrylic and cause a minor disaster. 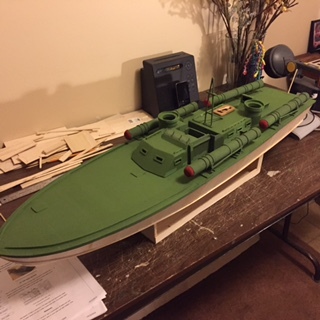 Try on a piece of scrap first, or consider a more benign top coat. There are acrylic based clear finishes and I think shellac may work, but confirm for yourself first. Again, great job!